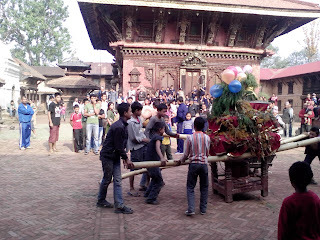 Some of the most fun you can have in Nepal for free are the festivals. You do not need to believe any way whatsoever, nor do you need to pay. Sometimes even the temple fees are not collected. The atmosphere is often like a parade but can have a serious feel. Please be respectful during these time and remember that even though we are spectators, the local people are worshiping their gods. They are having fun with their spirituality, so please do not insult them by smoking at the temples or pretending to be Hindu just to get a peak at an idol. Chickens getting sacraficed for the community meal. The theme of Bhairab Jatra is in unifying the community, as this jatra celebrates the lower castes, which include people of lower castes such as butcher, tailor, chariot puller and the music caste. The theme of this jatra is to show appreciation for the lower castes that do so much for society, as well as to honor Bhairab and the other gods. If the thought of sacrafices bothers you just remember this is a time when everyone get to eat a good meal-even with meat! Throughout the month of Baisakh, the Idol of Bhairab is carried by chariot from one village to the next, so the various communities can celebrate the festival and honor Bhairab, probably the oldest god still being worshiped. According to the historical record, the Newar people brought Bhairab with them when they migrated to the Kathmandu Valley so many millennia ago. Even so, Bhairab is honored as the angry, strong incarnation of Shiva. But rather than causing anger or discord, Bhairab takes the anger and transmutes it. When I hung my first Bhairab mask on the wall the entire energy in my apartment softened. The chariot is carried by people of the lower castes, which is an honor and anyone can touch and worship the idol by first touching its feet and then touching their forehead and then chest. There is also the colored powder and other items to ‘tika’ one’s forehead. Of course, there is lots of music and enjoyment throughout the festivities as the chariot is carried to the various villages with festivities going on until late into the night. 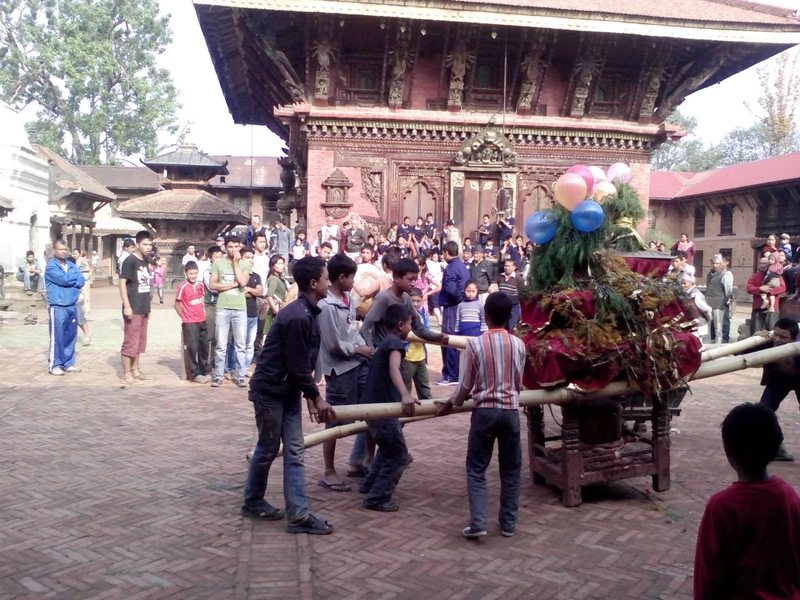 Cities and villages that celebrate the Bhairab Jatra are Kathmandu, Bhaktapur, Thimi and Kavre with the last celebration in Changunarayan where the idol is housed throughout the year. The reason for this festival has to do with Bhairab’s strength with the need to not become fooled by demonic gods. They paraded throughout Changunarayan for a week or more with the music and dancing randomly throughout the day and night. This chariot is quite heavy and is carried while the young men dance with it still on their back-Seriously, they dance while carrying it. Note about co-author, Bikash Suwal: Bikash has a Master's degree in Public Administration and works full time with us at the Star View Guest House in Changunarayan. He is Newar and is a practicing Hindu. My eBook is available now at https://payhip.com/b/sQu5 If you are planning a trip to Nepal you'll enjoy it. It will save you time as well as money, but more importantly, it will help you to have a better time in Nepal. Many people wonder if they can eat the street food like in Thailand or Vietnam.